Look what just landed on my doorstep! This book is HUGE. I had no idea it would be this big. 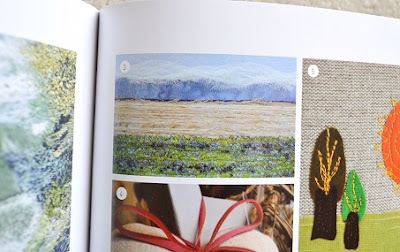 Inside nearly 300 pages are instructions and gorgeous photos from stitchers around the world. Spring on the Prairie, 2010 - my first piece of art! I have this one in my studio. Both of those little images are in Chapter 7 - Free Motion Embroidery. Sweet. 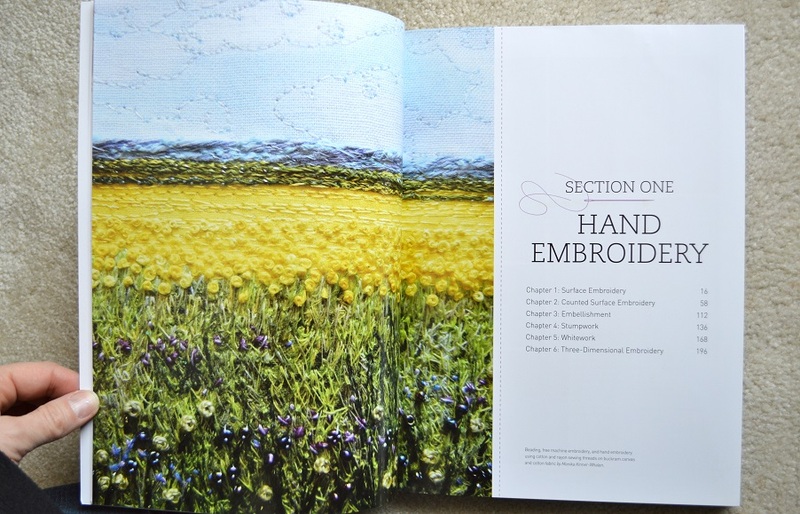 There are 2 sections to the book - hand embroidery and machine embroidery. 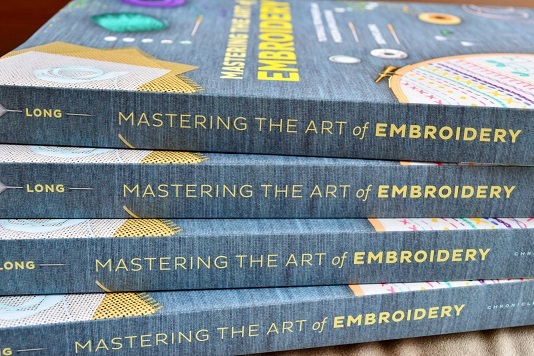 From goldwork to digitized images... this book is COMPREHENSIVE! That is something to celebrate. Way to go Sophie! 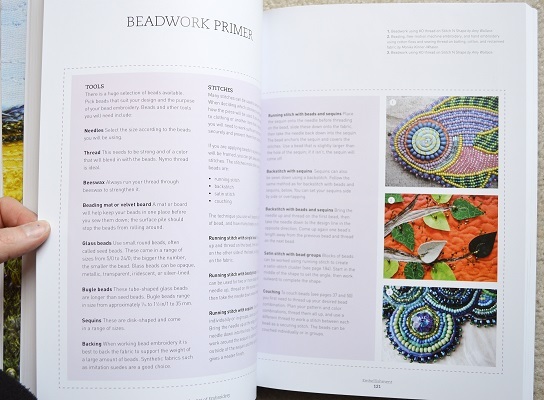 I found a third image of mine in the pages on Beading. Look! Do you recognize it? It was a commission from two years ago where a mom had me make a wall hanging out of her children's cloth carriers, booties. and other important items of hers. Image of My Sweet Prairie, 2012 - art has sold and is currently residing in Calgary. Of course, I'm over the moon! You really need to see the other images too. There are incredible works of stitched pieces by Japanese artists. There are things with steampunk flare from the UK & USA. There are simple, tasteful embroidered sketches. There are the most incredible beaded cuffs I have ever seen. There's an entire section on traditional whitework. The stumpwork is fabulous - traditional and contemporary art. I just think Sophie and her crew did such a great job. It is beyond any expectations I had for this book. You can find them at McNally Robinson's for just over $30CAD before tax. I ensured that Winnipeg will have extra copies for when I'm there in May. ChaptersIndigo does not have them on the shelves here in Saskatoon, but you can special order. I ordered a large amount of these books for gifts - one for mom, 2 for some very noteable collectors of my art, and three for the libraries of the guilds I belong to. Buying in bulk means that I got them for a good price. If you live near me and can't get your hands on one, let me know. If you are interested in a hardcopy signed by Sophie, go HERE to her webpage. It will be about $70CAN with shipping. DID SOMEONE SAY BLOG GIVE-AWAY? THIS CONTEST IS NOW CLOSED> CONGRATULATIONS MOLLY! Leave one comment with your email as one entry. Please, only one entry per person. However, if you follow my blog you can leave a second comment as a second entry. Sound good? I'll make a random draw by Tuesday midnight, and announce a winner on Wednesday March 14th. I'm only giving one book away though - and I'll sign it on my section page if you like! Good luck! Maybe first will be my lucky day. I would love to win a copy, Monika. I will definitely buy one if I don't. I really want to be able to show it to people and Say, See, I know her..... She's a wonderful artist. Thanks for the opportunity. Congrats again. I am so, so, so, so proud of you and all your many accomplishments. This is a good reminder to always take good pictures of our work before it leaves our hands. Fabulous job, Monika. What a glorious surprise for you to have so many of your pieces included in the book... and to have "My Sweet Prairie' be given such a place of dignity! WooHoo! I am so happy for you. Of course I'd love to win the drawing for the book too. Sounds like it is a great one. I do follow you blog - it's one I always look forward to read and drool over. Monika- it looks like a fantastic book- a great set of eye candy and lots of wonderful ideas. A terrific resource I am sure. Thanks for the chance to win this beautiful book. I am a follower too- both your blog and on facebook- I love seeing your gorgeous pieces of art. I am a follower too of your blog. I enjoy seeing your work and photos. How exciting. I am just starting out on my embroidery voyage so this would be amazing. This is so amazing Monika.....and well deserved! How thrilling! Congratulations! And , of course, I am a devoted follower...and love your work! Congratulations. I enjoy following your blog as I am a huge fan of your work. I would love to win this book , it truly looks amazing , thanks for the chance. Congrats to you , well deserved ! I am a happy follower , love seeing your work. How utterly awesome, Monika!! Congratulations!!!! I've been a fan of your work for ages, and aspire to make such beautiful pieces myself! I'm a follower, so I get 2 entries, yay! It is wonderful to see your work in this book! I would love to have one to see in person, thank you for a chance to win. 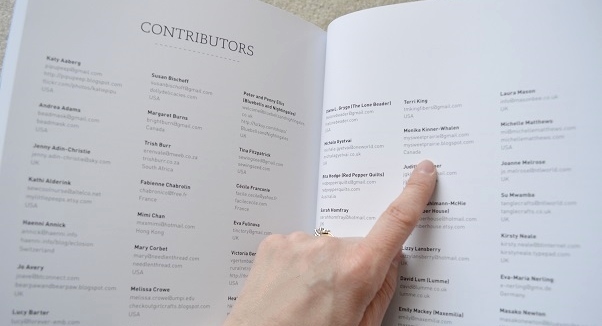 I do follow your lovely blog, congratulations on being in the book. Yeah Monika! You should be over the moon proud of this- the full page spread is enough to make you weep!!! Well done! I'm excited for you! It's wonderful, but not terribly surprising. You do good work! If I could afford to, I'd buy one of your pieces in a second. Since I can't, I enjoy the photos and look at them for inspiration. I'd love a copy of the book. It'll go on my wish list if I don't win. I subscribe to you in my Google reader. I don't know if I "follow" you on Blogger or not. I don't see a "Follow me" button, except for e-mail and that would not work at all. I am so looking forward to your show here in Winnipeg. Thanks for sharing your excitement with us all. I am now on the look out for the book at McNalley. I get chills reading this. How amzing it must feel to be included in this book. Good on you Monica you have done "the colonies" proud. Congratulations - the details of your embroidery are amazing! Congratulations, Monika, on your well deserved recognition! Congrats! I would love to win this book. Maybe my emboidery would improve! As a regular blog follower (*alas who has no following herself) I am submitting a second one. Wow, Wow, Wow, Wow and Wow! How incredible for you. Congratulations!!! Congrats! I am very proud of you. How exciting for you to be able to create the most amazing art and be recognized for what you do! Your joy is well earned as are your accolades. I am trying to find my own way in this "artistic" world and am trying my hand at everything I can. Your type of art work is something I definitely want to try and hope I can be even half as good. The book looks like an amazing addition to any library. Wouldn't I just luv to have a copy of this book!!! How wonderful!! Congratulations! It looks like an amazing book. Thanks for giving a copy away. What a fantastic Book. Congratulations!!!! I might just have to own this book -- whether I own it or buy it. And if we ever meet one day, I'll have to have your autograph to tuck inside! P.S. Look and see if she's included RSN alumna Tanja Berlin in any of the pages. Tanja lives in and works from her home in Calgary. 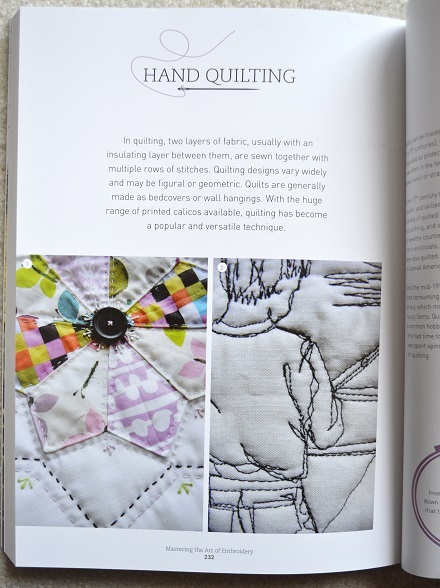 Congratulations of being featured on what appears to be a magnificent book on the art of the needle. I love seeing your work as it unfolds and it has inspired me to return to my own needlework. Thank you for the opportunity of winning this book! I would totally love to have that book! Congratulations to you, and I get your excitement to see your art in print. Someday you'll have a book where all the art is yours! You know I follow your blog. Love your work, and the prairies you represent. Congratulations Monika!! Wow!So many wonderful things happening in your world! You've earned it! Long ago and far away, when I was a little girl, we listened to a kids' radio show on Sunday mornings.It was about a little girl named Maggie Muggins and her friend Mr. McGarrity. Each show ended with her saying, "I wonder what will happen tomorrow?" That's how I think of you! So very happy for you. Oh, by the way, I'd be honored to win your book! Oh, and following your blog too! Haha... I dnt want a copy. But huge thank u! This is wonderful news Monika! You are so talented and your needlework exceptional... not at all surprised that you have been recognized!! Of course I would love to win this book and proudly you 'show off'!! No Tanya isnt included in my book...her work is gorgeous! I am following you via GFC and FB!! Not missing a beat - thanks for the chance! Monika, Congratulations! I am so happy to see your exquisite work recognized! I am super excited for you Monika! Congratulations. I feel like I know you a little bit because Dahn and I are friends and we exclaim over your work together. She's the thread painter though, I'm just a dabbler. But I do love hand embroidery. Please put my name in the hat for this book. Thanks. How wonderful for you and so well deserved. I would love to win as well. The book is so lovely and your artwork makes it just gorgeous! How amazing is that?! Much deserved! Congratulations! Whoop whoop!! Congratulations! What an honour, and so well-deserved. Your work is unique and exquisite. AND...you have put my beloved Saskatoon and Saskatchewan on the international map. So proud. Wow! You must be over the moon! You do such beautiful work, congratulations. I will have to put this on my to buy wish list. Congrats. I'd love a copy. Also I am a follower....but I will still follow you if I don't win a copy of the book but it would still be nice too! I am actually starting a hand embroidered piece for the first time in years due to the inspiration from your blog and a few others. Well done, Monika. Your work is lovely and you deserve the recogntion. I have been a follower for a very long time. Again, well done. WOW! Congratulations on your well-deserved features in this lovely book! Must be one of the nicest books out for a long time. A fantastic book and I say it again....... Monica, Your artwork is the most fantastic I´ve ever seen. It would be nice to have the book signed by you. And of course I´m a follewer of your blog and your Facebook page. wonderful, monika! what an amazing journey you are on and how much fun it is to tag along and see what new adventures you are having! love it! Well deserved, I' d say! Way to go! Congratulations! I am not surprised! Congratulations Monika. Well deserved! You must be thrilled and rightly so. All best wishes for future success. Wow Monika - that is fantastic. Congratulations to you and so wonderful that so many can enjoy your talents. PCC is lucky to have you with us. BRAVO! Well done! You should be over the moon! Hand embroidery is my first love where needlework is concerned...I used to sit with my gran and stitch, while she did her "fancy work" as she called it. i Have been following your blog for several years now and have seen your growth and success. Way to go girl! Congratulations!Your artwork is amazing and you deserve to be part of this wonderful book. Oops! I noticed a typo in my email address! It should read trueladyp@yahoo.com. I'd love to win the book, but will purchase it if I don't. Congratulation Monika! You are our pride of Saskatchewan's artists and Canada too. I am working on learning new embroidery stitches to put on quilts, so I would love to win a copy of this book. Congrats! That is so amazing! Thanks for the give away! This is absolutely awesome!! You must be SO excitied...I would have to lie down too! I would have been hyperventilating I think. Congratulations - you deserve it and I hope I win the give away! I am going for comment #2 - the book looks so fabulous I have to have it. As a life member of RSN it seems like a good thing to support the authro! Congratulations! Your work is simply beautiful. I am so happy for you! You have a great eye for seeing beauty and it is reflected back in your stitching and photography. No wonder Sophie found you! A book everyone who stitches should have. And I too look forward to My Sweet Prairie everyday. And so well deserved recognition of your outstanding work. Congratulations Monika! You are an amazingly talented artist and I am continually inspired by your blog. Oh boy, I think my love hooked prairie rug may have just doubled in value ;0! Congratulations, your work looks amazing in the book! This is a book I will definitely buy if I'm not the lucky winner, fingers crossed. Thank you for sharing and way to go! Being involved in such a high quality publication is just so awesome. Your work is an insperation to me It is because of this blog I started making the postcards and having so much fun with them Expanding my own work and I thank you for that. Also a huge congrat's on the book Thanks for a chance to win...if not have to look where I can get one!! Monika, that is so awesome! Congratulations on the well deserved feature. Looks like a fantastic book, and I'll have to add it to my wish list if I'm not the lucky one here! I am enthralled by your embroidery! I love seeing it come up on Flickr! Congrats on being in this great book! And since I am a follower I'll enter a second time! Love your blog! Look at you with 120 comments already for your book! Oh, you should be sooo crazy proud of yourself. I told my hubby all about you at supper... and to think I even got a phone call from you last year! Anyway, if I win, I totally want your signature!!! I am waaaay proud of you girl! Congrats! I guess you are over the moon! Huge honour and you deserve it! I'm adding this entry for a woman who is unable to comment here - she left me a note on FB. Such a beautiful resource! I would LOVE to win this book. I too subscribe to your blog! Such an inspiration! Congratulations to have your work in this fantastic book. You know I'm a fan of your work. Congratulations, Monika!! Its no surprise to me that your work was featured throughout this wonderful book. You're work is gorgeous! You inspired me right from the first time I found your blog. Its so interesting how you can find such awesome teachers and never even meet. Love the giveaway, thanks for your efforts, you make me want to write a book! I totally follow you. I missed you for a while and then found that gmail had marked all your posts as spam. I've had to go and retrieve yours because your posts are important to me. Thanks for the giveaway! Of course I'll enter your draw! Beautiful book! I would love to win this book. Thanks for the chance. no surprise you are featured, you make incredible art. WOW ... what an honour Monika ! I'm one of your silent followers, I'm following your blog for nearly a year, greatly admiring your work and looking forward every new project you are sharing with us, but I have never left any comments,mostly because I'm just too busy - being a mum to 3years old, running a patchwork shop, teaching patchwork, and trying to be a textile artist as well. But this time I made sure I find the time to tell you big CONGRATULATION!!!! Your work is fantastic and you sooo deserve this!!! You are great bloogger too, I love reading your posts, everytime there is an email from you I open it with the same exitement a child is opening an chocolate Advent calendar :-) It is so lovely to watch somebody do what they really love for living and one can feel your love and passion which goes to your textile work and the blog. I wish you all the best, for me you are great source of inspiration and motivation, and you are filing me with hope that one day I can acheive something like that as well. All the best from your admirer - Czech woman living on a small Island in UK. Congratulations Monika! I have been following your blog for some time and love to watch your progress as you work on your pieces, as well as the way you have been adding new things to your work - either ribbon or a building. You certainly deserve to be included in this book. Great give-away, would love to win but will buy if not. have it but they have now put it on their purchase list! Sending you a huge congratulations Monika which is richly deserved. 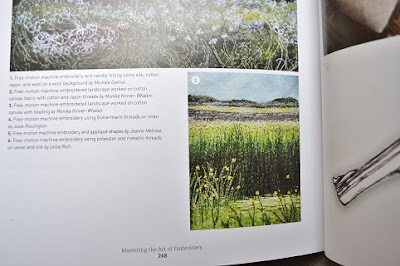 Your landscape pieces worked from your own photos are stunning pieces of stitchery and creativiity. 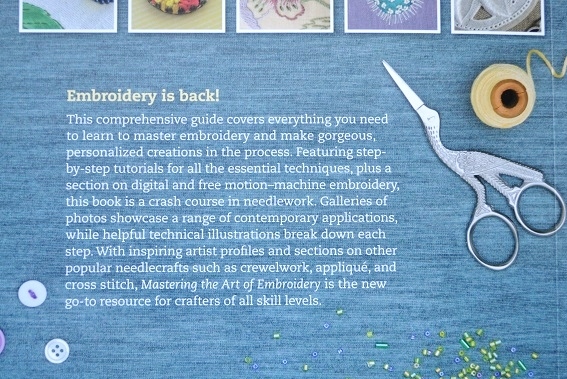 This will definitely be a book I will be purchasing for the Regina Stitchery Guild Library. I will keep visiting this blog very often. you got good stuff here. When things get rough just stay calm and ask assistance from God and he'll give you peace. Visit my site for more information. I like the way on how you put up your blogs. Wonderful and awesome. Hope to read more post from you in the future. Goodluck. Happy blogging!